In a saucepan on low heat, melt the butter. Add the thinly sliced onion, carefully separating all the rings. Stir and add a bit of salt and continue to cook on low heat for a long time, checking occasionally and stirring. Be patient and go read a book. You can cook it on higher heat, but the goal is not one single bit onion getting charred, so I slow cook it for two to three hours. You could also bake it in the oven at 350° but it stains the sides of the pan above the onions and is hard to clean. While the onions are cooking you could make the bread dough using this recipe a friend gave me. This makes enough dough for eight pizzas or four artisanal boules. I make it and just keep it in a plastic container in the fridge to use when I need some dough. I use it for boules, for pizzas, for fry bread, and for wraping around cocktail sauces or cheese for snacks. Anyway, the two hours the onions take is plenty of time for the first rise of the dough. Roll the dough out as thin as you can and the roll the edge to the center, just one roll so you have a bit of an edge to keep anything from going on the baking sheet. 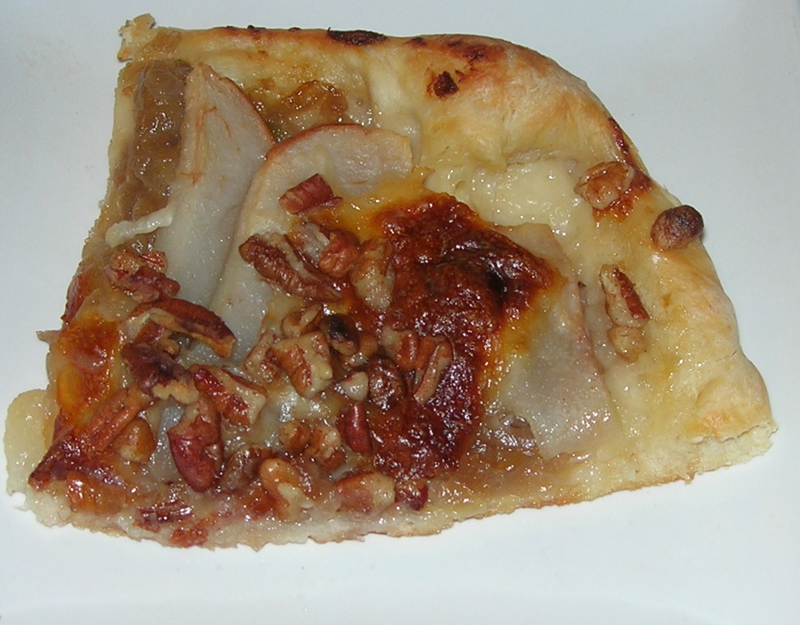 Spread the caramelized onions on the dough and spread to the edges. Sprinkle the mozzarella and pecans over the top. Bake for 20 minutes. Makes two services of two slices each. Let cool for about 10 minutes and cut into four pieces. Letting it cool makes it easier to eat and the flavors are more intense when they aren’t too hot. Also, when it’s hot out of the oven, everything will slide right off the bread. This is delicious, caramelized onions and pears are pure magic. I’ve made this with blue cheese too and it is delicious as well. This is a slightly decadent salad with a lush sour cream dressing. It was inspired by the produce in my box of Imperfect Produce. Except for the pecans, everything else was from my produce order. I started with a medium size head of cauliflower. I intended to make a smaller salad, but in the middle of cooking, I decided use the entire head and make one big salad. So sue me. 10 Medjool Dates. Remove the pit, cut into strips lengthwise, then cut then down to small 1/4″ bites. Makes about 1 cup of chopped dates. I tossed them in a plastic container, put a lid on it, and shook it to distribute evenly. Add to the bowl of salad, put the lid back on and shake it until it’s distributed. When serving a bowl of salad, chiffonade and chop a leaf of fresh mint. Don’t add the mint to the salad because then every bite would be minty and the flavor would overwhelm it. Instead, this gives you the unctuous creamy salad and occasional explosions of mint with the creamy salad. There’s a hint of sweetness from the dates and syrup, but it’s very subtle. The cauliflower is such a sturdy earthy flavor that it easily handles the sweetness. The texture mix is lovely with the different crunchy elements of the nuts and cauliflower with the chewy dates. This is an addictive salad and really one serving is not enough. 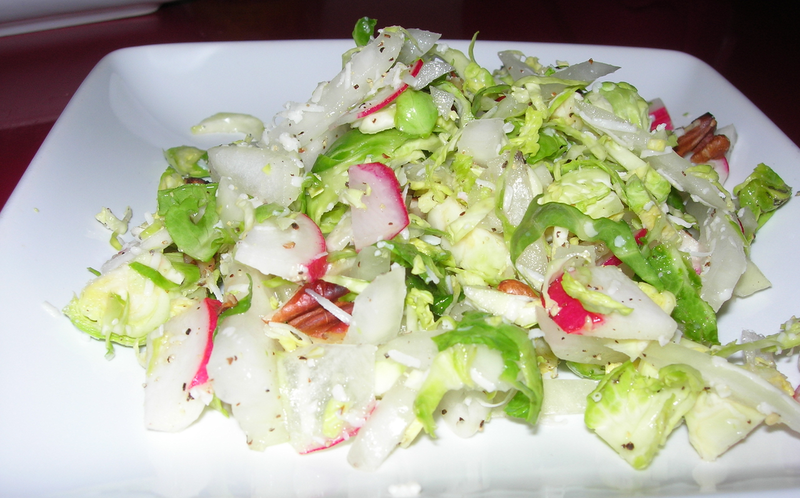 Continuing my experiments in search of a luscious red and green veggie dish, I tried Brussels sprouts and radishes. This is a delicious, light salad. I chopped and mixes the onions, radish, and Brussels sprouts. I squeezed the juice of one fresh lemon, added some salt and pepper and tasted. It was a bit too tart, but I didn’t want to add oil, so I added some cheese which offset the lemon’s tart bite. I added some pecans for texture and a bit of umami. This was delicious. 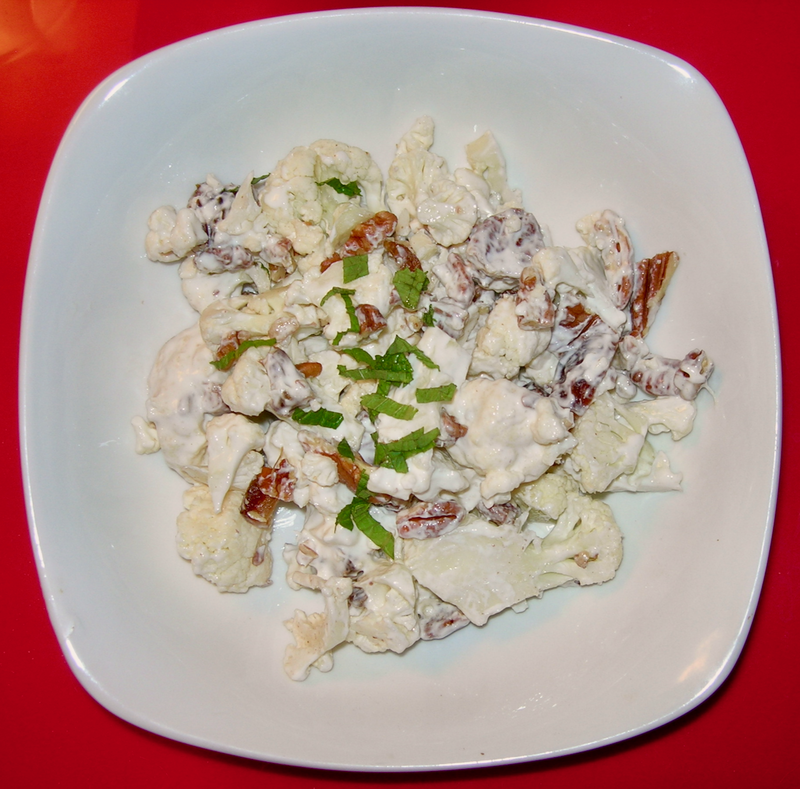 It’s light and delicate, with just the tiniest bit of cheese to balance the lemon juice and lemons love Asiago cheese and pecans. They are a magical combination that makes any vegetable delicious. This made four servings since I am experimenting for potluck fixings, not just myself. I got some peanut butter from Harvest Share last month and discovered that it actually is pretty good on celery. When the jar was close to empty, I thought it might be interesting to toss some rice vinegar, soy sauce, garlic, lime juice, and dried red pepper flakes, shake it up so the peanut butter sticking to the sides of the jar did not go to waste. I tried it on some lettuce and it was delicious. So this is the peanut dressing I made. Juice from 1 lime, squeezed. I thought it might be good with some chicken. So I sauteed a chicken breast with just some salt and pepper in olive oil. While it was cooking, I chopped 2 TBSP of yellow onion, thawed out 2 TBSP of frozen peas by running them in cold water, toasted 6 pecans in a dry pan and chopped them up. I removed the chicken breast and let it rest for about 5 minutes. Then I heated up my burner and with the air vent on high, charred two flour tortillas against the coils of the stove. If I had a gas stove, I would grill, but this is my “electric grilling.” Just lay them on the medium-high coil with half hanging off the edge so you can grab them. Flip with your fingers as soon as it begins to char, I generally “grill” on each side a few times to grill the whole tortilla. You cannot be doing anything else when you do this because you don’t want to start the tortillas on fire. It adds a really great flavor and makes delicious tortillas. 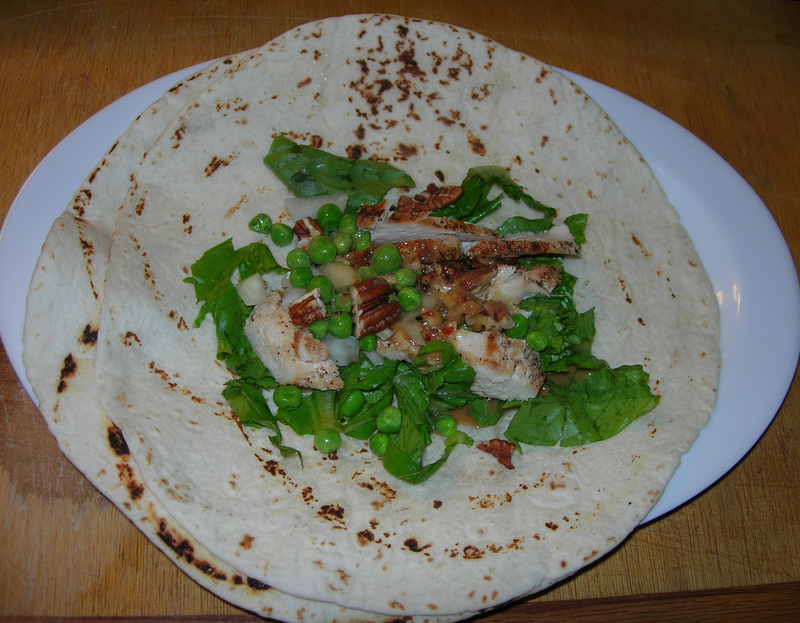 I compiled my dish with a small handful of lettuce, the sliced chicken breast, onions, pecans and thawed peas. I then added the peanut dressing and rolled them up. This is delicious. Chicken is such a mild ingredient that it embraces nearly anything you do. 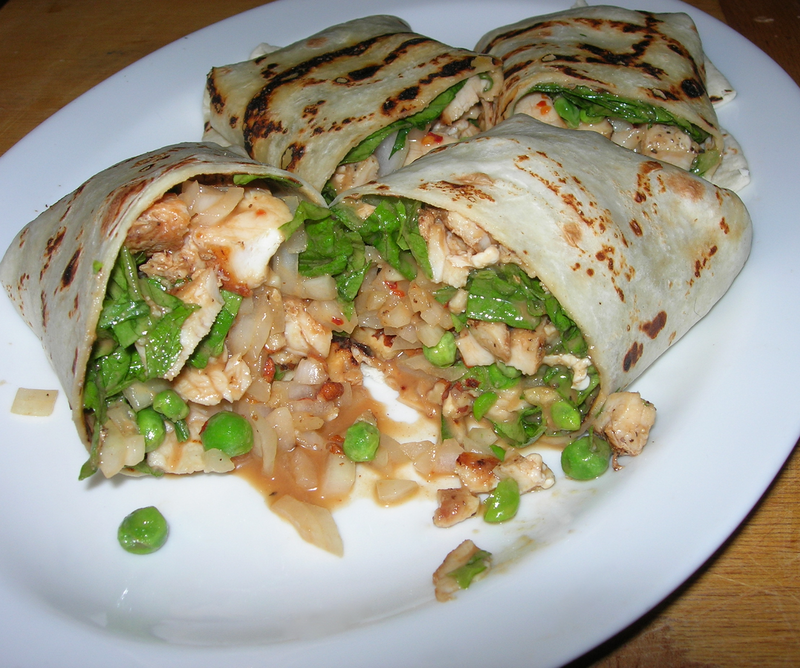 I liked the peas (And yes, fresh would be better, but needs must,) They added a bit of texture and freshness. It all went together so well. It’s zingy and spicy from the lime and red peppers and then the peanut adds this kind of hearty sweetness. I had three pears that were so ripe that eating them would have been a mess, so I peeled and mashed them with a fork and decided to try making a pear-based quick bread. I decided the molasses that I usually use for quick bread would overpower the pears and decided to use buckwheat honey instead. I also thought dried cranberries would not work well and opted for dried apricots, a milder flavor. This takes no special equipment other than a bread pan. First cream 1/2 cup of butter with 1 cup of sugar. I use a whisk, but if you have a mixer, use it. I used room temperature butter, but you can take cold butter, cut it into pieces and then cream it with the whisk. Once the sugar and butter is light and creamy, fluffy even if you have the energy, add the eggs, one at a time, whisking them into the batter. In a bowl, mix the mashed pears and buckwheat honey together. If you don’t have buckwheat honey, use regular honey, but use a little less. Buckwheat honey is not as sweet tasting. In another bowl, mix the flour and spices. Add the pear mixture and the flour mixture about 1/3 at a time, so you blend thoroughly, first the pears, then the flour, pears, flour, pears, and flour. Finally gently fold in the pecans and the dried apricots. Pour the batter in the greased bread pan and bake for about 90 minutes. Test with a knife after an hour or so and see if it comes out dry. My bread pan is one of those very thick insulated ones, so I need 90 minutes, but a thin bread pan will cook faster. I got about 5 pounds of fresh plums from Oregon Food Bank’s Harvest Share a few weeks back. I have been waiting for them to ripen, but decided to just try cooking one to see what happened. I was really not sure what I wanted to make. Well, I wanted to make a cake but I don’t have a mixer or blender and it’s hot and I didn’t want to turn on the oven, so I stood in front of the fridge hoping something would leap out at me. I saw some fresh rosemary a friend gave me from her garden and wondered how plums would taste sautéed in a bit of butter with some onions and rosemary. I have some tostadas from WinCo, so decided to try something crazy. 1/2 tsp of cinnamon. Stirring everything, I thought about adding lemon, but thought the unripe plum was so tart on its own, I didn’t really need the lemon. I spread it on the tostada, added some sour cream and lightly toasted pecans. This was so good, I washed out the pan and made myself a second one. Who knew rosemary and plums were divine? That is a flavor combination I am going to try again. Perhaps in a cake when it’s not so dang hot. Makes one serving, darn it. These are incredibly easy scones that take less than 30 minutes from start to finish. Preheat oven to 425° Fahrenheit. Most recipes start with preheat and your oven is heated up long before your recipe is mixed. Not with this, even starting to preheat before you mix one thing, you might have to wait to get to 425. Combine the following wet ingredients in another bowl. Pour them into the dry. You can make a little well in the dry ingredients to pour the wet in as that makes it just a bit easier to mix. Note: This recipe is so forgiving it does not care whether you melt the butter and add it with the milk and egg or if you mix cold butter into the dry mixture by hand until it is crumbly. You can choose. Either method has the same result. It is just slightly easier and faster to melt the butter in the microwave for 45 seconds or so. Mix the ingredients so all the dry is incorporated. It will be a wet, sticky dough. Put parchment paper on cookie sheet. If you are ambitious, you can flour a board and roll it out into two circles about 1/2 thick and cut each circle into 4 pie-size wedges. I think it is just easier to roll out eight balls of dough and press them into 1/2 thick little rounds. Separate them so they are not touching. Bake 15 minutes in the preheated oven, until risen and browned. You can serve warm with some butter, jam or cream cheese, but I like them plain with nothing else, warm or cold. 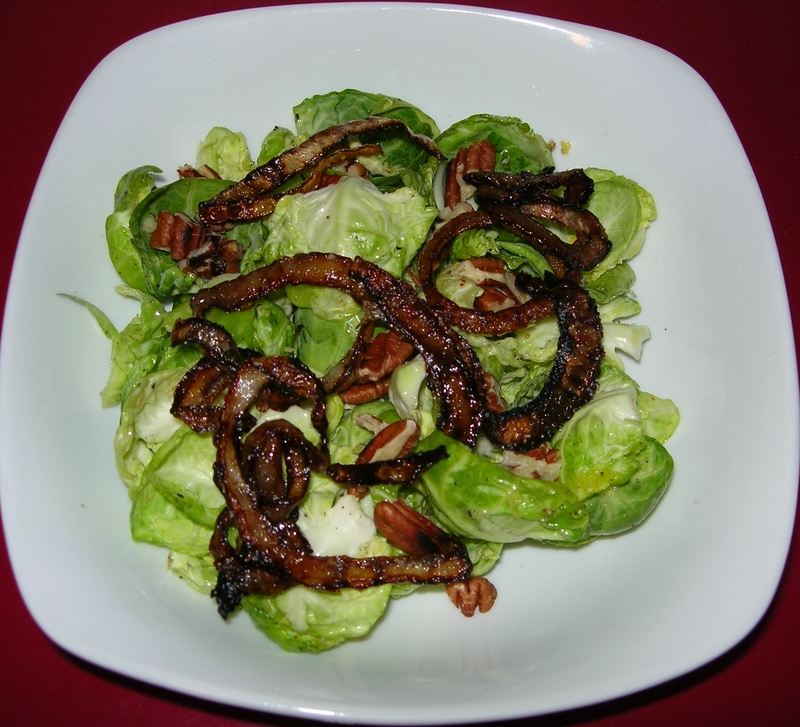 This tasty little salad was inspired by Kathryn LaSusa Yeomans salad with shallots. I used onions instead of shallots because that was what was on hand. I used more lemon juice and less olive oil than she does because that’s my personal preference. I wanted to try it with walnut oil but could not unscrew the top. I think it will take pliers! I also substituted pecans for walnuts because that is also my personal preference. Still, with all the changes, you can see her original inspiration in the final product. First I sliced a small yellow onion into 1/4 inch slices and patted them dry and let the rest a bit so they could dry some more. I heated up peanut oil to 350° and fried the onions in the oil. Removing the onions to rest on old paper bags so the oil could be absorbed, I salted them lightly while still hot so the salt would stick. After they were all fried and patted clean of oil, I let them rest. Then I cleaned one pound of brussels sprouts. This preparation was different than usual. I cut off the stems and cleared away the outer leaves that were browned or blackened with age. Then I peeled the leaves off, one by one, until they were too tight to peel away. This central core, I chopped thinly with a knife. I tossed the leaves and chopped sprouts in a bowl. Frankly, this part was tiresome and made me long for a sous chef. However, the separate leaves add a lighter, loftier texture to the salad and the individual leaves are perfect for holding dressing. It was worth the effort. One thing made it easier. After peeling off a bunch of leaves, it was easier to peel off the middle leaves by cutting off a bit more of the stem. Next I put some pecans in a dry pan on med-high heat to toast. While the pecans toasted, I took a fresh lemon and grated the zest into the bowl with the brussels sprouts. I added a generous amount of grated black pepper and some salt. Then I squeezed the lemon, adding all the juice. I drizzled 2 tbsp of olive oil on top and mixed them together. I removed the pecans from the heat and chopped them up just a bit. 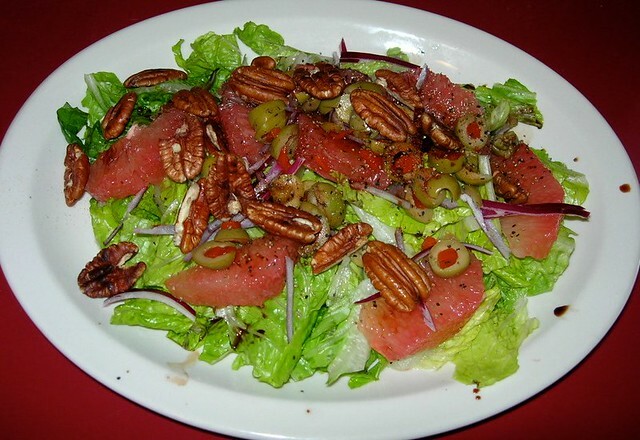 Then I placed a bit of the salad in a bowl, sprinkled some of the crispy, fried onions and toasted pecans on top and there it is – a light, flavorful salad for Christmas dinner. This made four salads. There is something about the flavor of toasted nuts and lemon vinaigrette that is just wonderful. The brussels sprouts with their sharp, tangy flavor blended right in and the pepper added a delicious mellow heat. It was just a perfect blend of flavors with the wonderful umami of the fried onions. This is a delicious dinner salad. Rinse and chop about half a head of romaine lettuce, making a bed for the rest of your salad. In a dry skillet, lightly toast pecans. Supreme one grapefruit, using a knife, cut the skin off a red grapefruit and segment it. Cut thin slices of red onion and break into circles that you quarter into small strips. Take 8 olives or so and chop them. Toss all on the lettuce. Splash with some walnut oil and balsamic vinegar and add salt and pepper to taste. It’s kind of amazing how delicious grapefruit and olives are together. Adding toasted pecans just makes it heavenly. First I started the rice, rinsing one cup in a strainer to wash away the starch before putting in a pan with 1.5 cups of water to cook. I added a bit of salt, put a lid on it and put it on high heat. As soon as it was boiling enough to rattle the lid a bit, I turned the heat off and let it sit. In 15 minutes it would be perfectly done. In a medium heat skillet, I added a bit of olive oil to coat the pan and when it was hot, I put on 1 pork chop and sprinkled some salt and pepper on it and let it begin to cook, flipping once so it cooked on both sides. Meanwhile, in a small sauce pan, I sauteed 1 TSBP of finely chopped yellow onion and 1 clove of garlic, minced with some salt and pepper. While they cooked to tender, I sliced 2 mushrooms finely and chopped. I cut 1/2 of a Bosc pear into slices and cut them in half again. I finely chopped 1 tomato. When the onions and garlic were done, I added 1/4 cup of mild green salsa, the sliced pears, mushrooms and tomatoes and let simmer until tender. Then I squeezed the juice of 1 lemon on and added about 10 pecans cut in half vertically. I dished up a 1/2 cup of cooked rice with the pork chop and served the sauce on both. 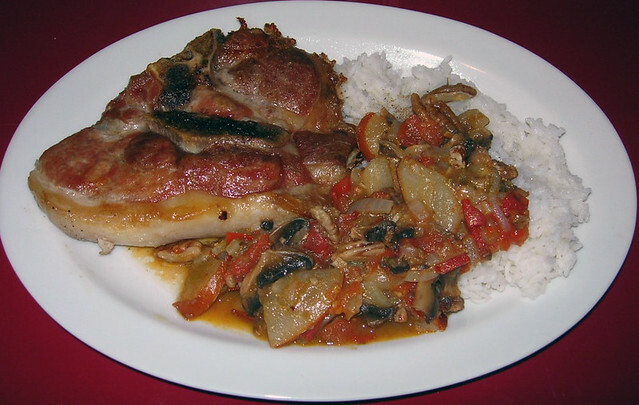 The sauce had lovely heat with a bit of sweet and sour flavors balancing each other. It was good on the rice, but magnificent on the pork chop giving an entirely new approach to sweet and sour.